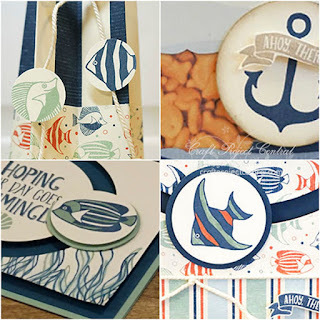 Just Julie B's Stampin' Space: Seaside Shore Ensemble! Whether you need a fun summer slider card or packaging for a seaside treat, you’ll be all set with this ensemble! You will absolutely love how easy it is to make the fun slider cards, and this tutorial demonstrates some very helpful tips and techniques that make the process as easy as a summer breeze. You won’t be able to decide which card to make first . . . or treat holder--the animal cracker-style box or the star-shaped bag. Make these projects with a friend or build a class around them! This awesome project was made by Regina Andari and you can get her tutorial when you subscribe to the month of July over at Craft Project Central. "Jars of Love" Card Assortment! Envelope Punch Board Mini Scrapbook! Timeless Grunge Card Set & Box! You Are Invited... to Movie Night! Tissue Box Gift Set & Card! Butterfly Basics Birthday Gift Set! Fruit Crate Treat Box for Class! Ice Cream Pinata Party Set!